Did you by chance catch the 20/20 piece entitled “Confessions of a Hairstylist”? In it they interview a hair colorist from Santa Monica named Ilona Shine. Many hair salons, stylists and colorists were concerned about the negative light shined on our industry by the segment. We’d like to take a moment to clarify XEX’s approach to some of the areas mentioned in the piece. The 20/20 piece suggests that hair salons are generally dirty places. We work hard to ensure that XEX is a clean space for our clients. We consider our salon a “discharging chamber”, where you can come in, relax and enjoy the highest quality of services. Cleanliness is a great part of ensuring that our clients are comfortable. We constantly work to ensure that everything from our sinks to front desk to the beautiful Darra art on display is clean. At XEX we do keep your basic information on file to make appointment booking easier for you. We do not keep more information than is necessary to provide you with the best services. We take your privacy seriously. The only notes we keep about your are about your specific needs. We love our clients and would not generalize you based on your tip amount or attitude. The 20/20 piece mentioned that “your stylist is almost always spilling your secrets and judging everything about you”. 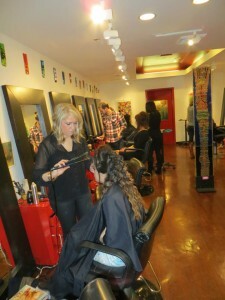 We understand that your stylist is often one of the first people that you are able to discuss stressful situations with. We take that responsibility seriously and value the relationships we make with our clients. If a client is excessively rude or makes a scene that effects other clients, we may discuss the situation internally to help other stylists handle similar situations in the future. Your personal conversations with your stylists are not the subject of salon discussion. We encourage you to read the follow-up interview Behind the Chair did with Ilona Shine after the 20/20 piece aired and the recent Huffington Post article responding to the article. Thank you for being a valued XEX client!